Especially a sermon on the prodigal son, the prince of the parables. The audience today matters so much because this is a parable for everyone. The tax collectors and sinners could hear this parable and comprehend their low estate. The pharisees could hear this parable and reflect on their misplaced anger and jealousy. Together they could hear it and enjoy being restored to God and one another. All of that is beautiful and true. And yet, that alone is not what makes this parable so brilliant. The truth is that this is is not a cautionary tale about the dangers of reckless living. Neither is it a story about the futility of envy. This isn’t even a parable about a prodigal son or his jealous brother. This parable is about the father whom neither of them truly knows or understands. You can tell that they don’t understand their father based on the way they act. The younger son thinks his father is stingy and ungenerous. Thus he asks his dad for the share of the inheritance that is coming to him. Commentators agree that this means he is asking for one third of everything. That’s all the prodigal son imagines his dad has for him: one third. The same goes for the older brother. He would have settled for a young goat and a sleepover with a few friends. But because they would not see this, each of them asks for less and not more. And he wastes it in pursuit of his own pleasure. In his despair, he decides he’ll go home, but for the wrong reason. He still doesn’t understand his father. In addition to being ungenerous, he also thinks his dad is gullible or naive. And he practices it the whole way back home. His father will let him work for a living like the servants, which would be several steps up for him. He thinks that whatever he has he will have to earn. Note how the father rescues his son from this. Firstly, he won’t let the son come home on his own two feet. Lest the son get the idea that he made it home according to his own reason or strength. 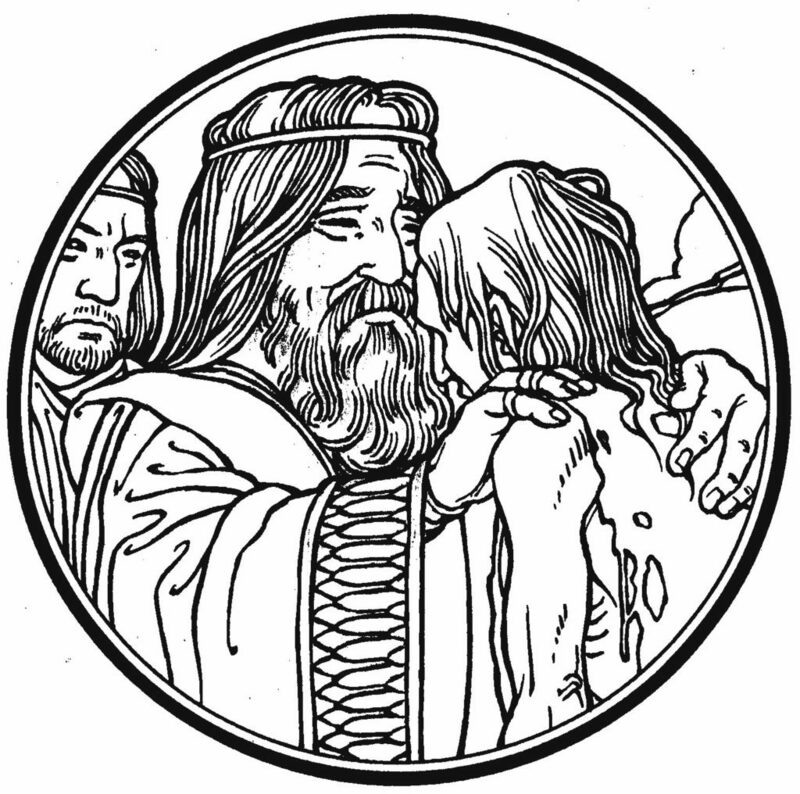 Secondly, by divine grace and mercy, the father tells the son to shut-up. He stops his confession right in the middle. Father, I have sinned against heaven and before you. I am no longer worthy to be called your son. But he is saved from the rest. He was about to ask dad to treat him like a hired servant. The father protects the son from a false confession that asks for a false mercy. No servant is given the best robe, which belongs to the father. No servant is given the family ring and the privileges of the family name. Without any merit or worthiness in him, the son is restored as family. This has major implications for the Church. People come here for all sorts of reasons. Sometimes people have been wounded, and they have no idea how to be healed. Sometimes people just feel desperate and hungry. Even if they wouldn’t say it that way. At the beginning of every Service, the Church gives you a confession. The Church actually gives you words to say and protects from words you shouldn’t say. One that ends up making excuses or offering ideas on how we can work it off on a payback plan. We might come up with all sorts of silly things to say. We might think that He’ll let us work our way back home. Bring quickly the best robe, and put it on him, and put a ring on his hand, and shoes on his feet. Though you have squandered much, your Father is not poorer for it. And all He has is yours. And that nothing matters to him. The events of the weeks to come make the opposite point. In the weeks to come, we will behold the cost of our wayward journey. Jesus has had to come get us. And he has come to find you, lost and poor in a distant land. He has brought you home again. The family name belongs to you as sons and daughters. There is no room for jealousy or comparisons. Forgiveness of sins, life and salvation, now and forever. All that’s left is to have a party. For this Man receives sinners and eats with them.